First off, before we go any further, I want you to know that I do not delude myself into thinking that a sugar-filled, buttery, chocolate-laden cookie becomes health food when I make it with whole wheat flour. And I will also tell you something else: these cookies are good. The whole wheat flour gives them a nutty flavor and deep color. The butter gives them a crispy edge. And the chocolate chips anchor them firmly in the realm of kid-friendly cookies. I had never made a bar cookie before tonight but I think they have won my heart. No rolling, no cutting, no shaping, no scooping, no baking of multiple batches because I had to spread the cookies out on multiple cookie sheets. This is pure, streamlined cookie production. The only downside is that the bars in the middle of the pan don’t have a crisp edge, so if you are an edge person you may want to take that into consideration and shape cookies instead. 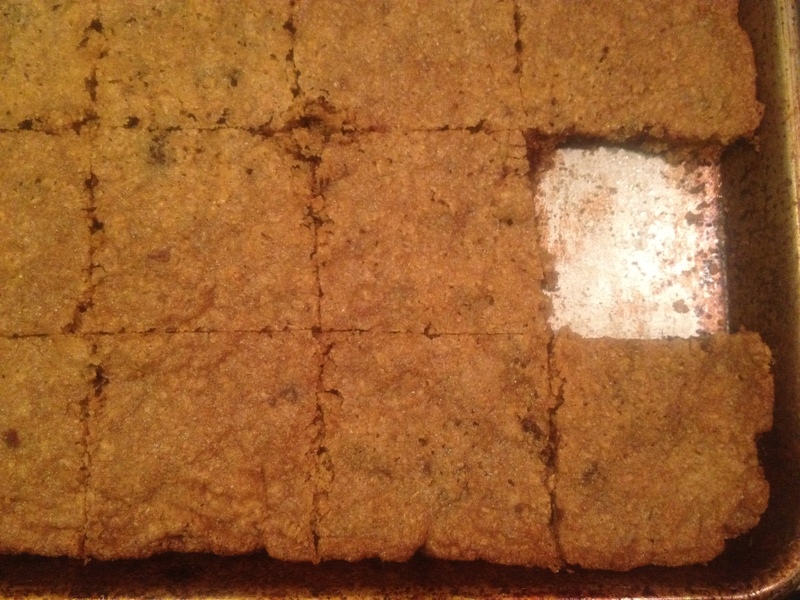 Whole Wheat Chocolate Chip Cookie Bars: In a medium bowl, combine 3 c. whole wheat flour (I used Nash’s soft white whole wheat flour, but I have also used regular whole wheat flour, which comes out tasting a little whole-wheat-ier; I like both), 1 1/2 tsp. baking powder, 1 tsp. baking soda, and 1 1/2 tsp. kosher salt. In a mixer, combine 2 sticks cold butter cut into 1/2 inch pieces with 1 c. dark brown sugar and 3/4 c. granulated sugar* and mix on low speed for a minute or two to integrate the butter and sugar. Mix in two eggs and 2 tsp. vanilla, then add the dry ingredients and mix until just combined. Mix in a cup and a half of semisweet chocolate chips (or 8 oz. chopped bittersweet chocolate, see below). Butter a large rimmed baking sheet (mine is 12×17) and spread the dough evenly across it. Bake at 350 for 12-15 minutes until the center is just set. Remove from oven and allow the tray to cool completely, then cut the cookies into bars. *The original recipe, from Kim Boyce’s Good to the Grain cookbook, calls for 1 c. granulated sugar and bittersweet instead of semisweet chocolate. I used what I had, but if you have bittersweet chocolate I think it would be great, and you might choose to use the larger measure of sugar with it. If you prefer to have a few freshly-baked cookies at a time, I’ve had good luck rolling the dough into balls and freezing them on a tray, then moving them to a freezer bag once they are frozen solid. Bake them without defrosting; it will take a minute or two longer than usual. This entry was posted in Baking, Cookies, Desserts and tagged baking, children, chocolate, cookies, cooking, dessert, DIY, family, food, homemade, kids, lifestyle, recipes, whole grain on March 10, 2012 by emmycooks. I have heard that whole wheat flour makes things heavier and stickier, with yummy gooey results. Do you agree? Gosh, I don’t know about stickier. I better taste another cookie to check! :) I do agree that whole wheat flour’s coarser consistency is heavier, though, especially if you’re using regular whole wheat flour. Whole wheat pastry flour seems to offer a (relatively) lighter texture, and white whole wheat flour is different again–it may still be somewhat coarse, but has less of the nutty whole-wheat flavor. I should add that this is all ENTIRELY unscientific and based only on my own baking experience, since I do use all of these flours and feel like some recipes will be best with one type and others with a different type. I should probably learn more about this topic, now that you mention it! These look SO amazing. I’m not usually a ‘bar’ cookie person either, but these may be the exceptionI’ve been looking for! If these don’t do the trick, I have the feeling that I’ll be experimenting with more bars in the future…we’ll find the one for you! We used half whole wheat, half white flour and added walnuts; the results were wonderful. We love the bars and had enough to make a few frozen cookies. Thanks Emmy. Oh wow. I would never have thought of using whole wheat for sweet things. But whole wheat and chocolate sounds pretty awesome to me right now! I’m into that kind of sweet/savory thing. Speaking of which, the chocolate & stout beer bread I made today falls right into that category. A little odd, a lot delicious!